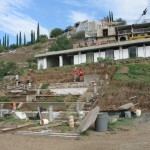 Arcosanti was designed in the 70's by Paolo Soleri, who dreamed of ecologically friendly cities. His soaring design precludes cars, integrates multiple levels within buildings and walkways, and includes space for around 5000 inhabitants — all supported and maintained in something like 15 acres. 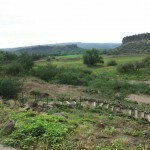 I visited Arcosanti in Arizona during my Great Summer Road Trip. It was both fascinating and peculiar. I came in at night, after dark, and the roads and signage were awful. The exit off the highway was being worked on, which made things slightly confusing. The road to Arcosanti rapidly turned into gravel/dirt washboard, which made poor Dark Star jounce around terribly — he's not built for that. I would really have loved more signs, too, since more than once I was left wondering if I was going the right way. Once I was on the actual property, it was clear there'd recently been a serious storm as well, because some of the twisting dirt roads were almost or partially washed out. It was very up and down hill, too, due to Soleri envisioning no cars. I saw several bicycles while I was there, but where would they ride them? They'd have to encircle the entire built-up area in order to get anywhere — unless they were willing to ride the bikes up and down the often-twisting stairways. The facility for visitors was on the backside of the currently built-up area, and looked vaguely like a long, low rectangular box of dull gray concrete, divided up into little cubes. Bugs and other critters were apparently a huge issue, since there were no screen doors, and there was a sign on all the doors warning you to keep them closed. That made heat an issue, since the concrete building held the sun's warmth way too well. Fortunately there were standing fans in each room — I ended up sleeping right in front of mine — and one of the "windows" that comprise the front wall is entirely screened if you open the door in front of it. 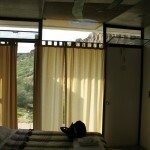 Also, the rooms all look out onto the desert valley, so you have a simply gorgeous view. 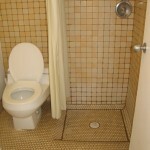 All the cheapest rooms, where you share bathing facilities, were already rented out, so I had to rent a $40 room with its own bathroom. Oh nosers? :) There were three cots neatly pressed up against all the open wall space, a wall which encompassed a small desk/closet/sink & mirror — and the tiny bathroom. 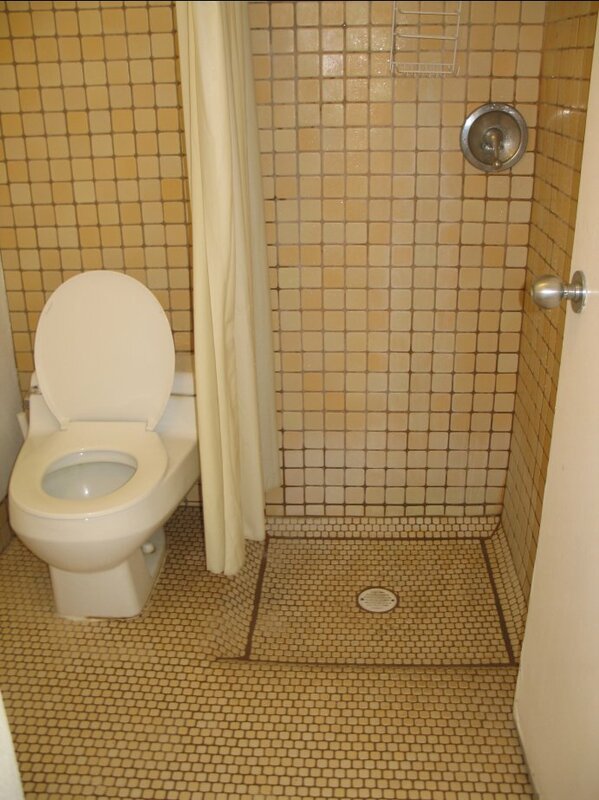 That I found rather cool, in that the entire thing was tiled, with a light plastic curtain between the toilet and shower head, and a dip in the floor so water would flow down the drain. I'm discovering I like the slightly more open style of shower — you don't feel all boxed in and blinded to the rest of the room. 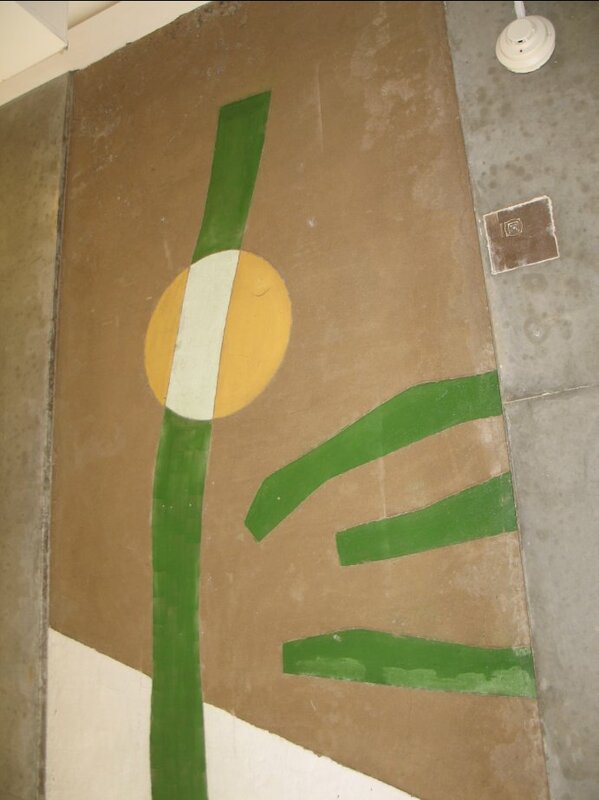 The dull gray concrete is ubiquitous throughout Arcosanti, and I confess I find it a particularly ugly, dead sort of color. 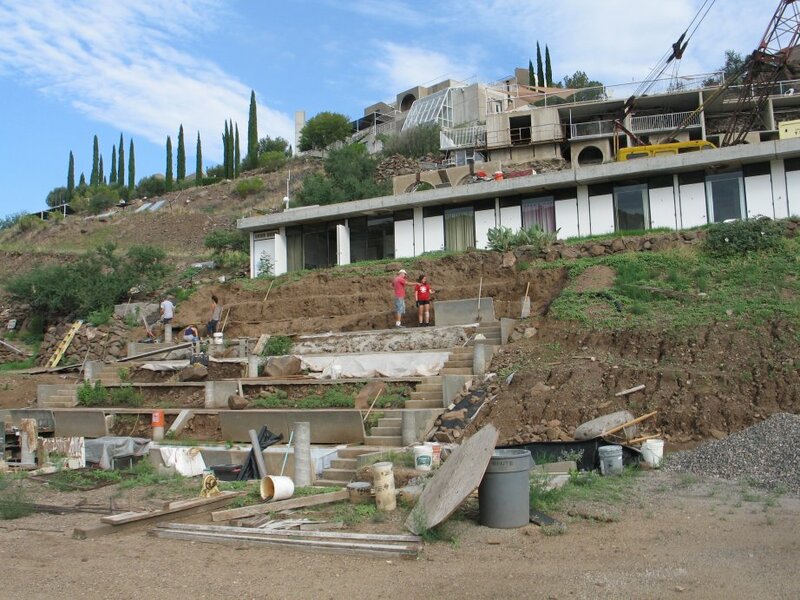 Its actual name is ferro-concrete, and it is the material of choice in Arcosanti due not to its cheapness but to its strength. Soleri envisioned 30 or 40 level buildings, but you can apparently only go up about eight floors with mud brick. I learned this while chatting with some rather scruffy and weathered-looking men over breakfast the next morning. That's when I also discovered they refer to Paolo Soleri as "Maestro." He's apparently still alive, but retired a few years ago at the age of about 96 or so. 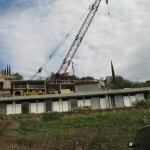 They're still working at Arcosanti to finish implementing his designs and blueprints from the 70s, since the local county — who must approve any changes — wishes for them to finish the current blueprints before embarking on any changes or new additions, or anything else more ambitious. Sadly, the tech for the more off-the-grid, energy-friendly stuff wasn't developed then, so that means they can't implement it in Arcosanti, regardless of how helpful it might be. Apparently Soleri did envision something like that, though; I wonder if it is being developed elsewhere? The completed buildings were clearly built with a very 70s vision (i.e. huge round windows, multi-level buildings with open centers up to roof), but they also have some rather lovely bits. 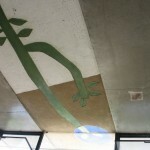 Whenever possible, decorations are added in: there are huge painted designs on walls, embossed ceramic pots hold hanging plants or shelter walk-way lights, swirling metal patterns outline the ballustrades, imprinted doodles in concrete stepping stones add a light-hearted touch, etc. Further, fruiting trees provide shelter over paths, along with triangular tarps in angled triple layers for shade, while flowering vines twine through bannisters and gates and hang from overhead trellises. It is pretty in places, despite the ferro-concrete. I consider it unfortunate that one of the first things visitors see is a boxy four-story ferro-concrete tower, rather than some of the nicer looking decorations. I would have covered that tower up with paint or mosaics or something, you know? I'd also have petitioned the county more urgently to be able to put in an elevator for easier access — although maybe they did; I don't know. I was told the walkway that allows wheelchair access to the building is a later retrofit, for example. Money seems to be a huge issue for them; while I was there one of the scruffy young men was searching Craigslist for free or near free furniture. I was pleased to be able to tell him about Freecycle — hopefully that will help them some. They're also a very multinational group, I think. I noticed what I believe were several Italians among them, and I heard what I think was French and another language I did not recognize while I was there. The head cook is a middle-aged Italian woman, and the guest services manager might have been also. The people working and living there that I saw seem to be grouped into mostly young, wiry folks (often in quite worn, ragged work clothes), and more middle-aged, more weathered folks. My guess is the young folks are the interns there for the season, working for the experience. According to the man I spoke with, only about 20 to 25 people live there year-round, and the greatest number of folks they get living there at the height of the building season takes them up to maybe 100, tops. It's possible I am letting the dank, dark gray ferro-concrete get to me — but there does not seem to be much of a sense of community here. Few people greet me as I wander among them, though to be fair that might be due to simple tiredness from the crushing heat outdoors. I find myself wondering why anyone would want to work in these temperatures — wouldn't it be easier to work only at dawn and dusk with artificial lights, and simply stay indoors and nap, or swim in the pool, during the blistering midday heat? I get a vague sense of a sort of weary urgency, a resignation, from those people I see working — as if they're desperately trying to get the dream built before it's too late, though I don't know what that lateness might be. From what the tour guide and the workman at breakfast said to me, it seems Soleri and his disciples expected the city to be well-completed by now. In the 70s they had grants and enthusiasm and the freshness of an exciting new dream. Now, 30 years and a few economic recessions later, only the central core is built. It's weirdly lovely in its own way — but it's only a tiny fraction of the proposed city. There seems to be a nearly 50/50 mix of men and women, curiously enough, with perhaps a slightly higher number of women. That made me wonder if Arcosanti deliberately selected for that, or if that was the actual statistic of interns applying. Women certainly seemed to be as much in charge as anyone else: the head cook was female, as were the young women I spotted running the crane, directing the work crew, running the gift shop, helping pour the molten brass for the famous Arcosanti bells, and leading the tours. I could see that being a natural outcome, though, considering Soleri was a big proponent of increasing the sense of community amongst groups of people living together — that was why he wanted there to be no cars, and for people to be able to walk anywhere they wanted easily. I found myself smiling ruefully as I glanced over some of his books offered for sale in the gift shop: despite the many forward-thinking women over hundreds of years who have emphasized the need for community and for living gently upon our earth, apparently it took a man talking about it for the issue to come to public recognition. Even here, though, the issue is contentious. Looking around myself while there, I wonder how Soleri intended to lure people out to Arcosanti for his ecologically-based dream community. The model of the completed city is beautiful… but it's in the middle of a desert! It's bloody hot, and I don't see much in the way of air conditioning in any of the buildings. Further, will Arcosanti be based on a gift economy, like Black Rock City at Burning Man, or is it supposed to be based in the more modernly common capitalism? If the latter, what jobs would the people in this city hold? I don't see any place for major industry in the model. I could see the city being entirely self-sufficient if it were well-designed and indeed working on the gift economy's principles — but in that case, with what money will the city pay any taxes or fees to the state? 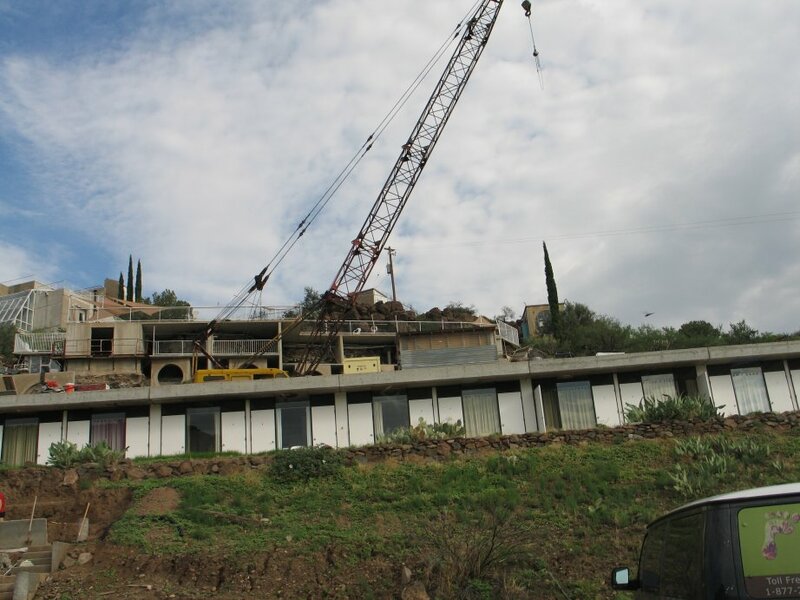 Further, if Arcosanti's dwellers wish to travel elsewhere, or receive visitors, where will they keep their cars? Regardless, the city continues to slowly rise in the desert, funded by sales of his famous bells, as well as those who believe in Soleri's vision of ecologically friendly, community-oriented cities. I wanted to do my bit to help, even though I am still somewhat torn on how I feel about Arcosanti itself, so I bought one of the small ceramic ones. It currently hangs in my living room, making me wonder about what precisely community is, and how we might more equitably live together upon this earth. 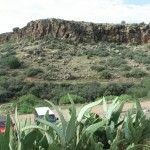 Here's the view from the parking lot at the foot of the hill the guest lodge is on. 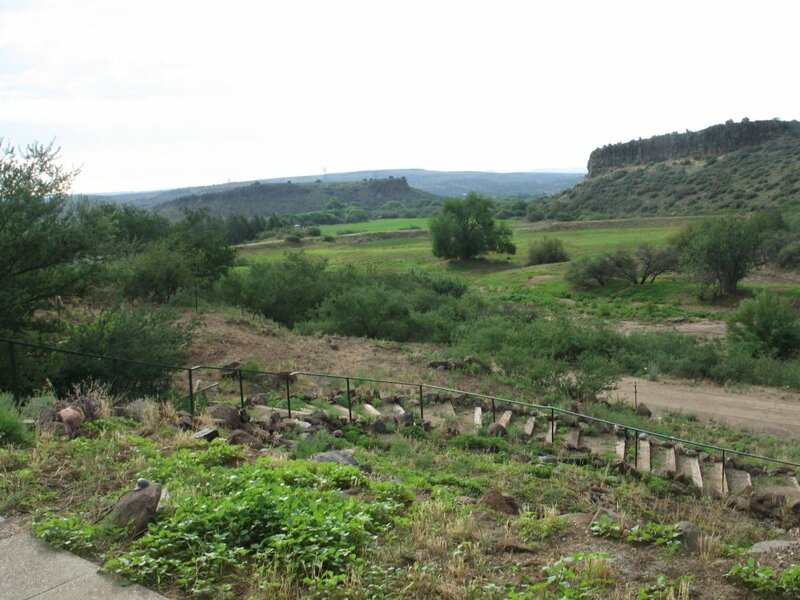 At the top of the hill in the background you can see some of the core Arcosanti buildings. The long, low barracks is the guesthouse, and below that is the current build site. 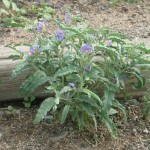 This is slightly to the right of the first photo. That's part of Dark Star in the lower right, for size comparison. The rightmost open door on the guest lodge is the screened window for my room. 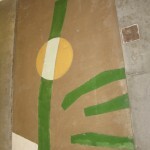 A shot taken while standing in the doorway of the Arcosanti guestroom I rented for the night. Note the flashlight on the desk — it gets dark at night on construction sites! 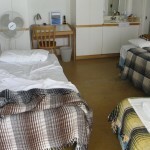 The beds are regular fold-away cots, all pressed up against different walls. You can see how snug the room is. 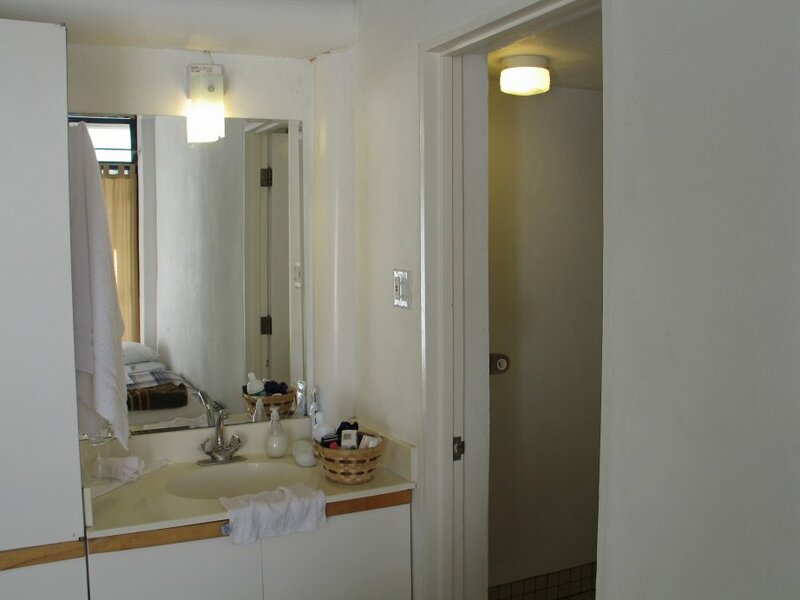 The sink (with my basket of toiletries) and the doorway into the Arcosanti bathroom. There's a sign warning you that due to their eco-friendly water system, it takes a few minutes to get warm water. They weren't kidding! But it was so hot, the cool water was very welcome. In the mirror you can just see the screened wall-window. 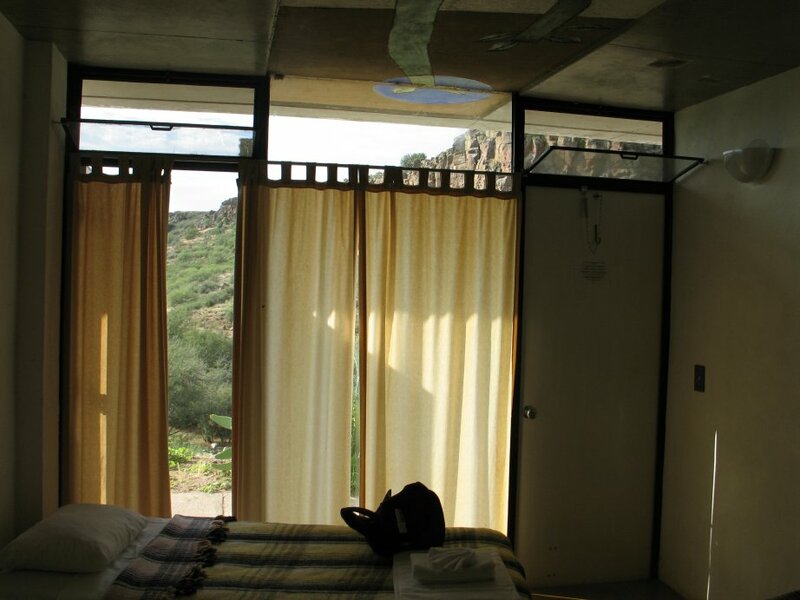 Standing at the desk, a shot of the Arcosanti guestroom's outside wall. On the left is a screened window with closing door; entrance door on the right — both with a little screened window above them. The curtains in the middle cover floor-to-ceiling window, and you can just make out the beautiful view beyond, and the ceiling decoration. Unsurprisingly it gets stiflingly hot in the rooms during the middle of the day! 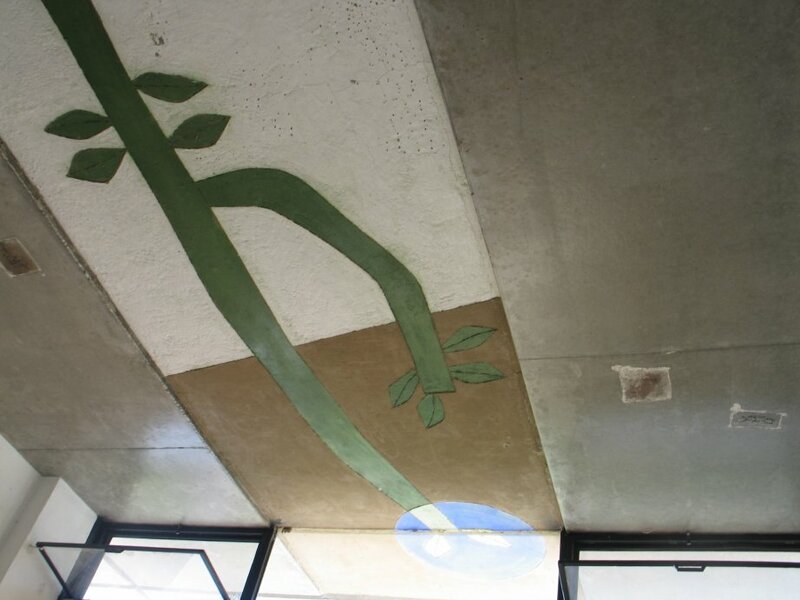 This is the uppermost part of the extremely iconic ceiling decoration in the Arcosanti guestroom I rented, furthest from the door. 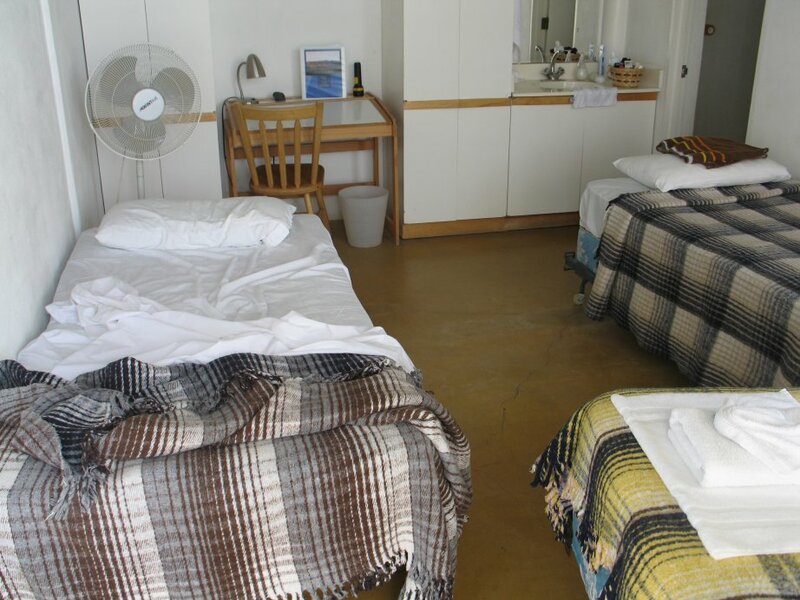 The rooms were quite plain, though also clean and relatively comfortable — depending on what time of day it was. I suspect they'd be cold in winter? The view while lying on the cot in the Arcosanti guestroom. The decoration extended right out to the outside walkway. You can clearly see the rough ferro-concrete slabs as well. Why didn't they let people decorate more, I wonder? 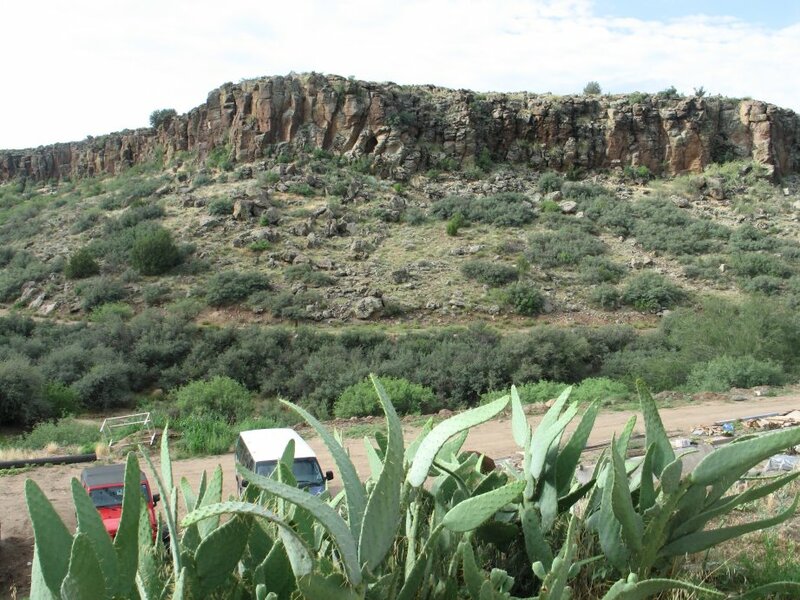 View while standing in the doorway of the Arcosanti bathroom. Toilet paper hung on a towel rack pole to the left. 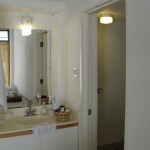 Cheap, clean towels were provided along with the room, and a bottle of liquid soap stood at the sink. 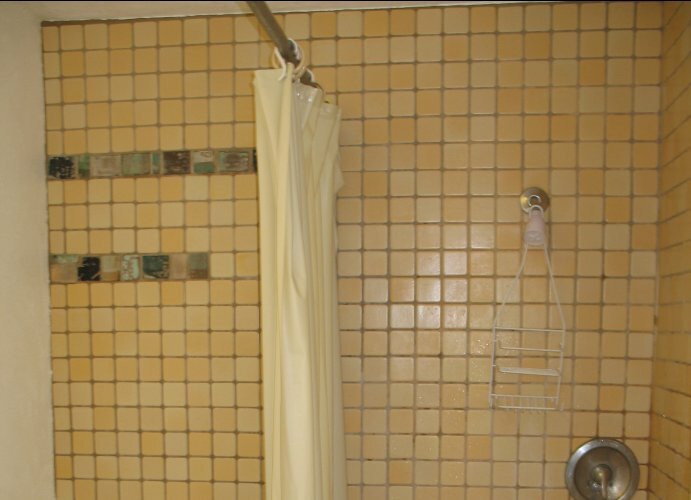 While I really like the shower, I wish the room were larger. This shot shows the single bit of decoration in the bathroom, as well as how low the room ceilings were — I think they were only about 6'6" tall. 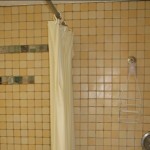 For comparison, I am 5'10", the shower floor was dropped by an inch or two, and the shower head was at eye level for me. The slightly cramped feeling was not helped in the main room by the dull gray ferro-concrete ceiling. This is the beautiful view from the doorway of my guest room, early in the morning. I regret not taking the camera with me to the room, because even earlier (like around 5am) the desert was glorious — all soft shades of rose and violet and misty blue before the rising sun burned off all the subtler colors. The stairs on the more polished side of Arcosanti were usually cement, but on this side of Arcosanti they were all very rough and simple: concrete flagstones (with occasional scratched decorations) at one-step intervals, or short log sections nailed into the hillside to create crude steps. 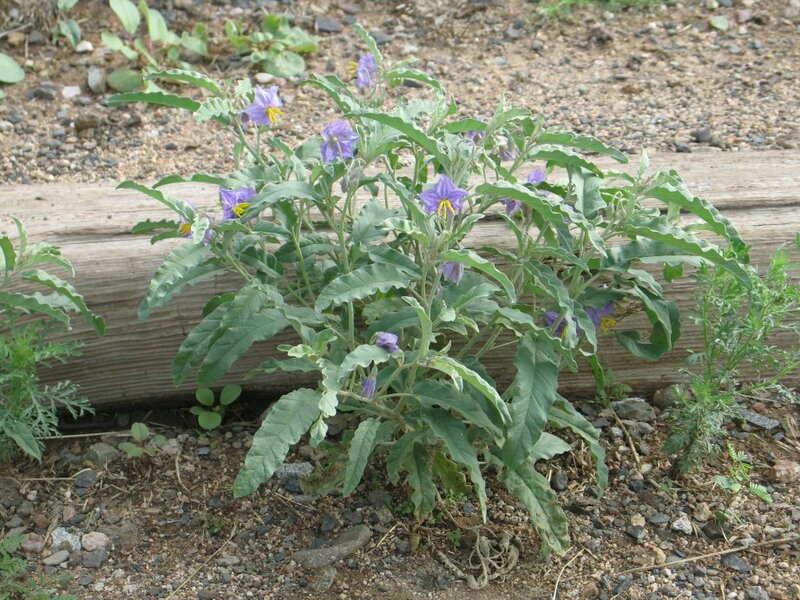 The stairway to the Arcosanti guestroom was quite rustic — this pretty little flowering plant was one of several growing right in the stairs. It sounds like a beautiful idea that some very dedicated people are struggling to build, despite the relentless and impersonal pressures of bureaucracy. It is a shame when something with the potential to be beautiful is crushed by thoughtless rules. I am not surprised the recessions hurt them, but saddened to hear they haven't found new big donors. I'm also surprised and confused by the response of the county planners, and find that a crying shame. Paolo Soleri was the first to come up with the concept of 'arcology.' Since that time, his initial vision of the ecologically-friendly, compact and low-impact city has been mostly ignored in favor of continued urban sprawl, leading to the concentric rings that characterize most modern US cities (and some European ones): A depressed inner city that's been more or less abandoned, a ring of commercial and industrial districts where most of the employment takes place, and a residential sprawl the goes on and on and on. Soleri's ideas were revolutionary, in part because there's no way any extant city could implement them. part of it is cost — they'd be rebuilding the entire city — but part of it is tribalism. The suburban sprawls have a vested psychological interest in keeping the inner city inhabitants separated from them. This is also partly why cheap rapid transit has such a hard time gaining a foothold: Certain people don't want it to be 'too easy' for 'them' to come out to the suburbs. Soleri's ideas should have taken hold, though. With the growth of the 70's and 80's, there was excellent opportunity to apply his arcology ideas. And yet, they didn't. I think part of it smacked too much of 'communism' for some people (and yes, that's a ridiculous notion) and for others, it was just too 'different.' I admit, I'd like to hear what an authoritarian would have to say about Soleri's ideas, if to just see if I'm right about why they weren't implemented. As an interesting side-note, I think he would be horrified at the idea of the arcology as implemented in cyberpunk: Huge towering edifices, completely self-contained, might have on the surface fulfilled the needs of maximizing comfortable human habitation, but they did so without blending into the existing ecosystem. Just the opposite: They existed by eliminating the existing ecosystem and replacing it with one that is entirely artificial. Re Soleri: there does seem to be quite a bit of 'us' vs. 'them' still extant in city planning. I remember the furor about BART building an extension out to the San Francisco airport — apparently "undesirables" would be traveling through a "nice" neighborhood to get there, gasp! There was similar horror in the planning for the San Jose Light Rail, as I recall. I can see people like that not really wanting to build the type of community which Soleri envisioned with those they see (&/or fear?) as their "lessers." Maybe that's what Soleri — or his disciples — need to work on next: how to change inner city sprawl into the beginnings of an arcology. I'm not talking about the concept of gentrification here, of course — that just throws out all the people and communities who were living there. I have to admit, though: what do you do with those who were living there, while you try to build a new place?